“The Belgian city of Ghent is about to become the first in the world to go vegetarian at least once a week. 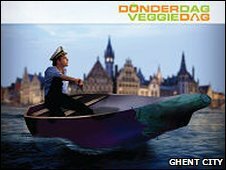 The UN says livestock is responsible for nearly one-fifth of global greenhouse gas emissions, hence Ghent’s declaration of a weekly “veggie day”. Public officials and politicians will be the first to give up meat for a day. Schoolchildren will follow suit with their own veggiedag in September. It is hoped the move will cut Ghent’s environmental footprint and help tackle obesity. Around 90,000 so-called “veggie street maps” are now being printed to help people find the city’s vegetarian eateries.